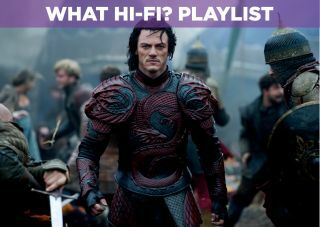 Dracula Untold - Blu-ray review | What Hi-Fi? Poor old vampires. Once the legendary figures of terror, they have become synonymous with angsty teen fluff. Bram Stoker would turn in his grave. But now we come full circle to the Daddy of vampires: Dracula. There’s quite a lot here about the torture of immortality. None of that sparkly nonsense, thank you. As the title suggests, you don’t know this part of his lore. These are the wilderness years, fleshing out the time before he begins to resemble Gary Oldman. That’s right, we have another prequel-reboot at hand. As is customary with prequels, we join the main man before he sinks his teeth into his eponymous role. He’s a perfectly affable chap – talent for impaling enemies notwithstanding – minding his own business in Transylvania. Naturally, Bad Things soon happen and he gets a bit batty. This is, of course, the best part. Vlad’s transformation into Dracula plays out rather oddly like a superhero origins story. Faltering first steps and a ridiculous number of bats: Gotham City certainly springs to mind. Dracula Untold takes the time to have a little fun with established vampire tropes. Vlad’s obligation to dodge sunbeams around town is appreciably more effective than any ceiling-walking in Van Helsing. Why so serious? What does every superhero do with new powers? Grow repetitive, of course. The set pieces are a good laugh, but it’s hard to cheer Vlad’s ability to burst into a cloud of bats for the 10th time. Then the tone drops off a cliff. There is an abundance of slow motion and floaty choruses, and some risible dialogue about the power of love. Poetry is recited. Ultimately, Dracula Untold lacks the conviction to drive the stake in any direction. By refusing to choose between stylised silliness and Gothic romance, it ends up like the bats: all over the place. It is best to take this more as a sensory exercise, because it’s a good workout for your system. The picture is a pleasant one. There’s plenty of light and dark. The palette offers enough variety – Vlad’s red armour looks particularly sumptuous. Special effects are fairly convincing. On the audio front, you get DTS-HD Master Audio 5.1. Did we mention there are a lot of bats? They are sure to challenge any system’s effects-steering prowess. Whether or not you are a fan of vampires, Dracula Untold offers something a little different. Sure, it lacks bite. But unlike poor old Vlad, it’s harmless and ends in 92 minutes. Add it to your Netflix list.